2010 Starcraft Limited 2018 I/O R.E. Today’s Starcraft is a company run by the same family, the Schrock’s, that started it all back in 1903. In 2010, Starcraft’s lineup is one of the largest with twenty-seven models of fibreglass runabouts and deck boats, and a staggering sixty-two aluminum models ranging from the smallest ten-foot Jon boat, through canoes, utility boats, to pure fishing boats, to the largest twenty-seven foot pontoon boat. The Limited 2018 I/O RE is a brand new fibreglass runabout for 2010. The interior, like all Starcraft fibreglass sterndrive runabouts, features a cushioned rear sundeck with a flip-up starboard section with storage below to allow easy passage from the swim platform. This flip-up section is also adjustable as a headrest for more comfortable lounging positions. There is a rear bench seat and two bucket-style sliding helm seats with a flip-up bolster. Two full-length facing lounge seats flank the bow area. Dual consoles support the walk-through tempered glass windshield and the driver’s side is custom-molded silver-metallic with a full complement of domed gauges including trim and temperature gauges behind a custom steering wheel. A tilt wheel is optional. An AM/FM stereo with auxiliary MP3 port and four speakers is standard. Hour meter, digital depth finder, satellite stereo, and 6-disc CD changer are optional as is a stereo remote control at the swim platform. An extended swim platform with boarding ladder, ski tow ring, and stainless steel gunnel rail are all standard. Starcraft offers a reverse chine hull with integrated stringer system and injected foam construction. The Limited 2018 I/O RE has a full fibreglass inner liner and bowliner. It comes complete with a lifetime hull warranty and a five-year blister warranty. Additional notable options include Silent Choice through-hull exhaust, snap-in cockpit carpeting, bimini top and storage boot, cockpit and bow covers, visor, sides and aft curtain, mooring cover, wake tower, and a nifty fish package that converts the sundeck and bow area to receive removable pedestal fishing seats. 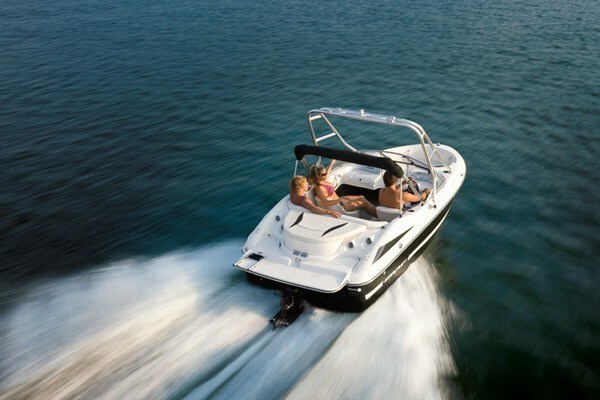 Standard power is a MerCruiser 3.0 L, 135 HP sterndrive. Maximum power for the Limited 2018 I/O RE is 220 HP.